The Argonne Forest lies between the battlefields of the Champagne east of Reims and the ground at Verdun. The fighting here in 1914 established the lines around the forested area of the Argonne, where it would remain for much of the rest of the war. Still a forested area, it contains to this day much evidence of the war with trench lines still visible in many places. 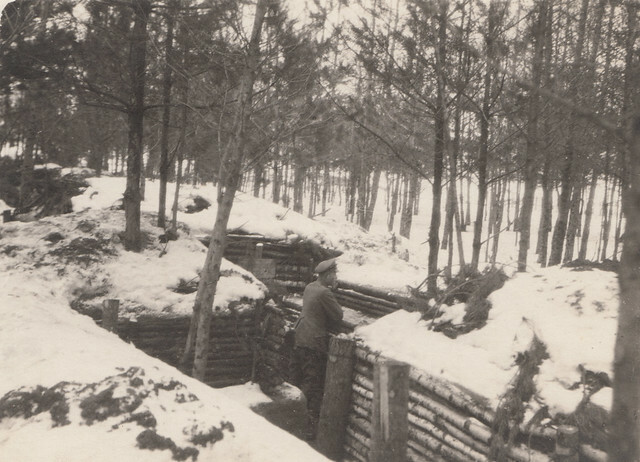 This German image dates from the winter of 1915/16 and shows a well constructed trench in the Argonne Forest, where a lone German officer looks out across the snow. The lack of damage and the fact that he has no problem about popping his head above the parapet would indicate this was a reserve trench line, some distance back from the actual battlefield. Much of these reserve lines in the Argonne were finally taken by American troops in the final battles of the autumn of 1918. This entry was posted on 10/12/2012 by sommecourt. It was filed under Argonne, France, French Front, German Army, Great War, Trenches, Western Front, WW1 and was tagged with 1915, Argonne, Argonne Forest, German Army, Snow, Trenches, Winter, Winter War, WW1.